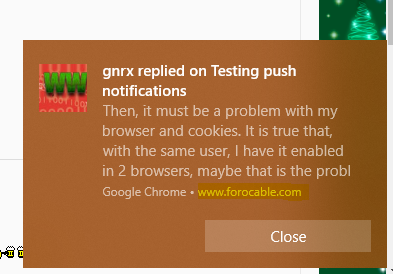 Are you speaking of the domain name shown on the notification itself at the bottom? The domain name will always show as the root domain, but when you click on it, it is supposed to take you to the correct thread. Yes, I know that, in the notification appears the root domain, its when click, go to root domain. Your notification its better than one of me, when I received a notification I made a screenshot, its a little different. Si, veo que si, aquí y por mp. Dónde exactamente y/o que tipo de error tienes? Si, los he recibido todos, bueno, en total 6. Vigila que en tu cuenta no tengas desmarcada la opción de guardar copia de mensajes privados enviados, si esta desmarcada, no tienes copia de mensaje enviado y quizás eso es lo que te lleva a confusión. When I was going to test the push notification then suddenly chrome keeps crashing and is not opening now. Please help me to fix the problem because I cannot open the Chrome browser at all. Delete your profile folder of chrome, uninstall chrome and delete all chrome folders, restart computer, install again chrome, and try.